Sony’s PlayLink series of games have been a huge hit at my get togethers. The ability to pull out our smartphones and jump into a game on the big screen is always a great way to keep a room full of people entertained. Up until now, though, there was always a lack of card games. I know what you’re thinking, we could just open a deck of cards. While that’s true, I prefer the ease of letting a game do all the setup for me and handle the rules. Just Deal With It! Is here to offer five classic card games for your next game night. So, should you sit down with this dealer? Let’s find out. Like all the other PlayLink titles, Just Deal With It! Requires you to download a smartphone app before you start playing. This will allow you to log in, make your profile, and snap a quick selfie to go with your avatar. Once you’ve done this, the host will pull everyone into a hub area where you can select from one of five classic card games: Texas Hold ‘Em, Rummy, Blackjack, Crazy Eights, and Hearts. Each game offers a basic tutorial to get you started, but I would have liked the option for a quick reference guide during play. For example, with Texas Hold ‘Em, many of the players (myself included) couldn’t tell you the difference between a straight flush and a full house, or which one was better. Just Deal With It! Does a good job of providing the basis for this information, but accessing any kind of rules like this during gameplay requires you to leave your screen and potentially lose your turn. That’s right, the game doesn’t allow you to pause, something that was quite frustrating when I wanted to stop and check the rules for games in the collection. The ability to pause or open a quick reference guide on your phone screen that breaks down the basic rules in a bullet point fashion would have remedied this. Other elements could also use better explanation. In Rummy, for example, it took far too long to figure out how the game wanted us to lay down our melds. While the majority of the foundation is here, the game could use a few tweaks to make the experience smoother and more welcoming to all levels of players. 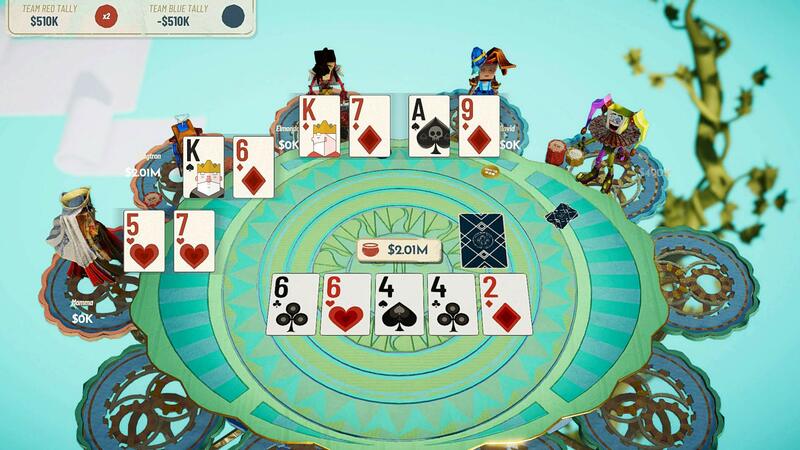 Beyond the card gameplay, objectives appear on your phone screen that reward you with sabotages in return for taking some risks or reaching a goal. These are fun, and often ask you to do crazy things like go all in. The pay-off isn’t quite as exciting, however. The sabotages make things difficult for other players, but not in any meaningful way that would cause them to mess up or lose their turn. In other words, the reward isn’t balanced with the risk. There’s also a lack of stakes, which is odd considering the nature of these card games. Running out of money simply results in you having the option to buy yourself back in as many times as you’d like. This does go against your overall score when you return to the hub, but I would have vastly preferred higher stakes where players are eliminated until one person is left standing. Instead, scores are calculated in the hub world when you return from your various games. Certain rewards both positive and negative are handed out as well, based on your performance. It’s a nice idea, but again, it goes against the tension these games should have. It’s not exciting to go all in if you know you can just replenish your stock each time you lose. 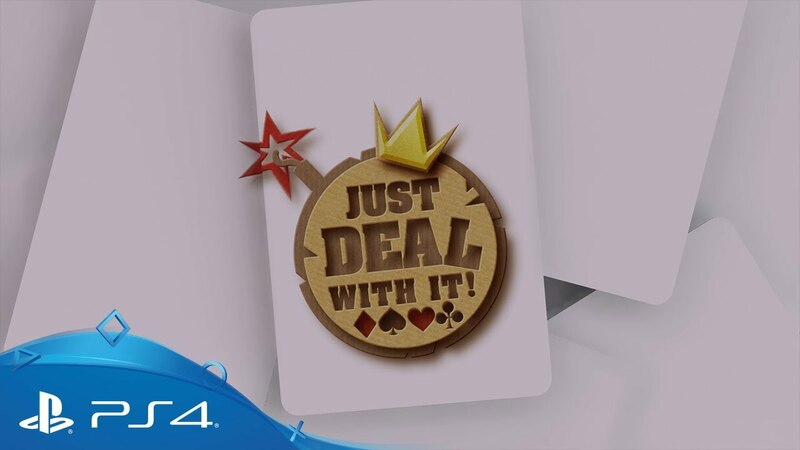 As a digital card game, Just Deal With It! Works well and succeeds in what it set out to do. That being said, it doesn’t do enough to welcome players or mimic the adrenaline rush of high stakes games. The attempts to add power-ups also fall a little flat when it’s apparent they aren’t worth the risk. Just Deal With It! Has a nice papercraft aesthetic that gives the game plenty of color surrounding the playing cards on your screen. You can trigger various reactions and taunts on your avatar as well, which is a fun way to react to events on the screen. The host character is fine, but his accent seems out of place in the game’s world. Furthermore, his jokes don’t often hit the mark, leaving him as a relatively bland member of the proceedings. In the end, I always prefer a digital option over setting up physical cards and managing the rules myself. In that regard, I would go to Just Deal With It! long before I break out a dusty old deck. While there are certainly opportunities for improvement, the vast majority of the experience here feels good and offers a quick way to play some classic games with your friends either in person or online.